ModusDoc Portable is a feature-rich but easy to use application designed to help you organize and manage your applications, documents, notes and webpages. Since the application is portable, you can run it from any internal or external storage device, including a removable USB flash drive. From the program’s menu you can quickly create and switch between databases. To create a new database you will first need to create the groups you want to organize your content in. New records can be added from both main and right-click menus, or via the dedicated commands available on the panel’s edges. 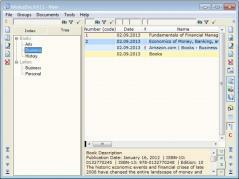 Also, ModusDoc Portable lets you edit and delete entries as needed. To add photos, videos, audio files and applications, you must create a new instance, point to their location on your computer and fill in the required information.